When I was a child, a kind of art was popular in Iran, which I can describe as a sort of collective illustration reading. I have been captivated with this art for a while, thinking how greatly it resembles “reading” a picture book or an illustrated story, feeling amazed that nobody has yet mentioned this resemblance. This art-ritual is called pardekhani. There are illustrations on a large canvas named parde and a person called pardekhan stands before the crowd, points to an illustration with a stick, and narrates its story. Most pardekhanis, however, are about Imam Hossein and in such cases pardekhani becomes a religious rite and a kind of mourning. According to some believers, attending this type of ceremonies can bring blessings into one’s life. Among us Shiites, Imam Hossein is famous for resisting oppression and for his free spirit. The unjust martyrdom of him, his family members and 72 of his friends in Karbala (a town in present-day Iraq) has created a huge number of influential literary and artistic works. 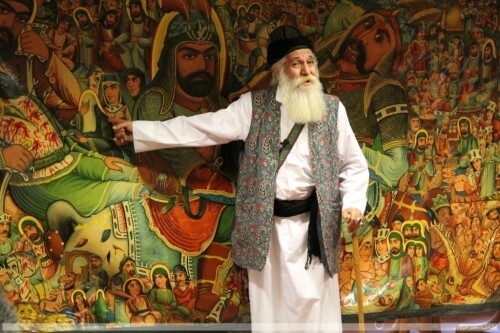 This effective literature becomes the backdrop of one of the greatest gatherings of ritual arts for several days and nights in the form of noheh (a kind of dramatic religious music), tazieh performances (a kind of religious theatre), and rozeh performances (a kind of story-telling combined with mourning). On Imam Hossein’s martyrdom anniversary and the days coming before or after it, various towns and cities in Iran and other countries where Shiites are in the majority are greatly influenced by these rituals. In modern theatre in Iran, playwrights and directors have tried to use this art, but I have been thinking for a long while about books that can be narrated in the style of pardekhani. I have imagined stories illustrated on huge canvases and the storyteller or pardekhan pointing to a picture on the canvas with a stick and read or tell the story of that picture.